Kelly's tenure has been dogged by speculation that he is frustrated and exhausted by his job and the president's mercurial temperament. John Kelly, President Donald Trump's chief of staff, is expected to stay with the administration through 2020, a senior administration official with knowledge of the plan told NBC News on Tuesday. Kelly told staff on Monday that Trump had asked him to remain in his post through the 2020 election, the source told NBC's Peter Alexander. Kelly then told those in attendance that he had accepted the president's request. Kelly recently celebrated his one-year anniversary as chief of staff. He was tapped by Trump as chief of staff last July after his predecessor, Reince Priebus, was ousted after six months on the job. 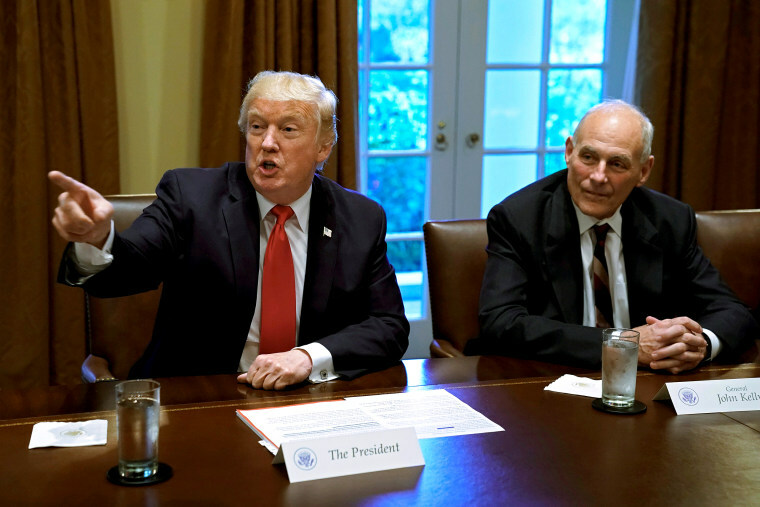 Kelly previously served as Trump's secretary of homeland security and is a retired four-star Marine general who served in the military for more than four decades, making him one of the nation's longest-serving commanders. The Wall Street Journal was the first to report Kelly's decision to continue in his current position. John Kelly's White House tenure has been dogged by speculation that he is frustrated and exhausted by his job and the president's mercurial temperament — and that the president has at times been angry and vented his own frustrations about Kelly. In the past, he has quelled those rumors, promising last October that he was “not quitting today” and was not getting fired anytime soon, either. "I read it all the time, pretty consistently, but I'm not quitting today, I don’t believe," John Kelly told reporters in October 2017. "And I just talked to the president. I don't think I'm being fired today."